Germany coach Juergen Klinsmann returns to his home city of Stuttgart tomorrow for the World Cup third-place match determined to finish the campaign in style and give the fans something to celebrate. Seven Italians, four Frenchmen and as many players from Germany and Portugal, two Argentine and one player from both England and Brazil made it to the 23-member FIFA World Cup 2006 all-star squad announced here today. 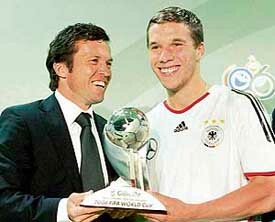 German forward Lukas Podolski has been named Best Young Player at the World Cup. Cristiano Ronaldo of Portugal was runner-up, according to FIFA. Other finalists were Lionel Messi of Argentina, Luis Valencia of Ecuador, Tranquillo Barnetta of Switzerland and Cesc Fabregas of Spain. Italy’s golden boy Francesco Totti has flattered to deceive on the international stage, and Sunday’s World Cup final could be his last chance to show the planet he really is the genuine article. According to Italy coach Marcello Lippi, the Roma captain is almost certain to call time on his Azzurri career after the Berlin showpiece against France. Italy, who meet France in the World Cup final on Sunday, have received generous praise from an unexpected quarter — Raymond Domenech. The new version of the much criticised football world rankings has been revealed by FIFA. Chief among the changes is that results from the past four years and not eight as was previously the case will only be taken into account. Bill Shankly felt football was more important than life and death, and fans around the world agreed with the former Liverpool manager today. Scotsman Shankly, who died of a heart attack in 1981, beat former Manchester United and France forward Eric Cantona in a poll organised by the Plain English Campaign to pick football’s most memorable quote. Argentina’s Horacio Elizondo was selected to referee Sunday’s World Cup final between three-time champion Italy and 1998 winner France. Elizondo, a 42-year-old physical education teacher, officiated Portugal’s quarterfinal victory over England, when he sent off England striker Wayne Rooney for stepping on Portugal defender Ricardo Carvalho. Roger Federer stormed into his fourth consecutive Wimbledon final with a 6-2, 6-0, 6-2 thrashing of Sweden’s Jonas Bjorkman today. Martina Navratilova bade farewell to Wimbledon as a competitor last night, failing in her attempt to set an outright record for titles at the All England Club. In his first speech after taking over as the new ICC President, Percy Sonn promised full support for Zimbabwe to overcome the series of crises which culminated with the African nation being suspended from Test cricket until next year. Klinsmann, who was born in a small town near the city and made his name as a clinical finisher at Stuttgart, has every reason to be proud of returning there to face Portugal. The hosts, who went further than most people expected and only lost to Italy after extra time in the semifinal, want to give the fans something to cheer in their final appearance. There is also the matter of clinching the Golden Shoe award for striker Miroslav Klose, who tops the World Cup scoring charts with five goals so far but is doubtful through injury. “We definitely want to win the match. In the Olympics, the bronze medal counts for something,” said goalkeeper Jens Lehmann, who will drop out of the starting line-up to give Germany’s number two Oliver Kahn a taste of the action. Portugal coach Luiz Felipe Scolari has his own reasons for wanting to finish the tournament with a victory. “We have to get rid of this melancholy, we still have a target,” said the upbeat Brazilian. The third-place match is often criticised as a lame duck but the hosts, Portugal and FIFA have all put on a brave face before the game and a sell-out crowd will ensure a vibrant atmosphere. The fixture is notorious, though, for pitting two emotionally shattered teams against each other when they might prefer to slink off home and bury their sorrows quietly. Germany, in particular, will have a big job to lift themselves after their dramatic semifinal defeat on Tuesday, when Italy scored twice at the end of extra time. Portugal’s dream of a first appearance in the World Cup final ended with a controversial penalty as they lost 1-0 to France on Wednesday. Their exit was less traumatic as they surpassed expectations by making the last four for the first time since 1966. FIFA defends the third-place fixture’s existence at every World Cup and spokesman Markus Siegler was clearly prepared when, inevitably, he was questioned about it on Wednesday. Germany are certainly taking the game very seriously and Klose will be desperate to play since his five-goal tally is two ahead of Thierry Henry and three in front of Luca Toni, the France and Italy strikers who are preparing for Sunday’s final. However, the tournament’s top scorer may have to miss the match with a calf problem and Germany will also be without captain Michael Ballack, who has an inflamed left knee, defender Per Mertesacker, who will have surgery on his foot this week, and right back Arne Friedrich with a knee injury. The Italian dominance was clear with Gianluigi Buffon named as one of the three goalkeepers, while the Marcello Lippi-guided side also contributed two each in the defence, midfield and the forward line. The list of players, selected by FIFA’s Technical Study Group, includes the French quartet of Lilian Thuram, Patrick Vieira, Zinedine Zidane and Thierry Henry. Hosts and semifinalists Germany are represented by custodian Jens Lehmann and the trio of defender Philipp Lahm, skipper-midfielder Michael Ballack and the top scorer so far Miroslav Klose. All-star squad: Goalkeepers: Gianluigi Buffon (Italy), Jens Lehmann (Germany), Ricardo (Portugal). Defenders: Roberto Ayala (Argentina), John Terry (England), Lilian Thuram (France), Philipp Lahm (Germany), Fabio Cannavaro (Italy), Gianluca Zambrotta (Italy) and Ricardo Carvalho (Portugal). Midfielders: Ze Roberto (Brazil), Patrick Vieira (France), Zinedine Zidane (France), Michael Ballack (Germany), Andrea Pirlo (Italy), Gennaro Gattuso (Italy), Luis Figo (Portugal) and Maniche (Portugal). German forward Lukas Podolski has been named Best Young Player at the World Cup. Cristiano Ronaldo of Portugal was runner-up, according to FIFA. Other finalists were Lionel Messi of Argentina, Luis Valencia of Ecuador, Tranquillo Barnetta of Switzerland and Cesc Fabregas of Spain. Messi, Cristiano Ronaldo and Valencia made the shortlist by finishing in the top three of fan voting via www.FIFAworldcup.com while Barnetta, Fabregas and Podolski were nominated by FIFA’s Technical Study Group. Podolski finished fourth in the fan vote, which drew nearly one million ballots. The 14 members of the Technical Study Group decided the winner. The original field consisted of 40 players. Podolski, who turned 21 on June 4, has three goals in six matches at the tournament. “It is a great motivation to go on playing and become more successful,” Podolski said after receiving the award at a press conference. The Polish-born striker was chosen ahead of Cristiano Ronaldo, who was blamed by England players for encouraging the referee to send off Wayne Rooney in England’s quarterfinal defeat. Holger Osieck, who heads the FIFA Technical Study Group, dismissed English journalists’ assertions that Cristiano Ronaldo was a “cheat” and therefore did not meet the fair play criteria for the award. “I would not agree. That is a harsh formulation,” Osieck said in reference to accusations that Cristiano Ronaldo had urged referee Horacio Elizondo to dismiss England striker Rooney off after he had stamped on Portuguese defender Ricardo Carvalho. Italy’s golden boy Francesco Totti has flattered to deceive on the international stage, and Sunday’s World Cup final could be his last chance to show the planet he really is the genuine article. According to Italy coach Marcello Lippi, the Roma captain is almost certain to call time on his Azzurri career after the Berlin showpiece against France. “As far as I’m aware it’s 90 per cent he will quit,” Lippi said on Wednesday. “However, you always have to wait to find out what is going through people’s hearts and minds before commenting,” he added, suggesting there is a small chance Totti will continue. The 29-year-old striker broke his left ankle in February and spent three months on the sidelines, raising doubts that he would be fit in time to travel to Germany. But days of intense workouts in the gym and at Roma’s Trigoria training ground convinced Lippi to name Totti in his 23-man squad. The talismanic Roman struggled for fitness in the early matches of the tournament and his sluggish performances were heavily criticised by the Italian media. He was sensationally dropped by Lippi for the second round match against Australia, but came off the bench to score the winning penalty in the fifth minute of stoppage time. Totti showed nerves of steel to slam home the spot-kick and wasted no time in hitting back at his detractors. As his fitness has improved, so have his performances, and he showed touches of genius in the 2-0 extra-time defeat of Germany in Tuesday’s semifinal in which he played the full 120 minutes. Totti can turn it on week in, week out in Serie A, but there is a sense of unfulfilled potential about him at international level with just nine goals in 60 appearances and only a handful of memorable moments. And unless Totti produces something special for Italy on Sunday he is likely to be best remembered for his poor disciplinary record. He was tipped to lead the Azzurri to success at the 2004 European championships, but instead he left Portugal in disgrace after spitting in the face of Denmark’s Christian Poulsen in the first game of the tournament. Totti was given a three-match ban and Italy were knocked out in the group stages. The 54-year-old French coach revealed himself as an out-and-out fan of Marcelo Lippi’s Azzurri, and was savouring the prospect of the clash in Berlin. “The game has the makings of a beautiful occasion,” he said here less than 24 hours after Zinedine Zidane’s penalty fired Les Bleus past Portugal and one step away from the title. “A beautiful occasion because it’s a World Cup final and because it’s against Italy. That was certainly the case when France ran out golden-goal winners against the Italians in the Euro 2000 final. Italy partly owe their presence in Berlin to Lippi’s brave late substitutions which bolstered his forward line to four strikers with the move paying off handsomely as his side prevailed 2-0 in extra time with penalties looming. Two other former factors have been taken out of the equation — number of goals scored and whether the matches were played at home. Points will be allocated thus in major championships with three points for a win, one for a draw and none for a defeat. Germany in particular had complained that them being 19th in the rankings while Mexico are fourth and the United States fifth is unfair and that they have been penalised for playing friendlies for the past two years. As hosts, Germany did not have to qualify for the World Cup. The United States crashed out in the first round and were highlighted as a particular disappointment by FIFA president Sepp Blatter, second ranked the Czech Republic also went in the first cull and Mexico in the second round. FIFA president Sepp Blatter said the new system was more simple. “We have acknowledged the need for a substantial revision. I am convinced our experts have come up with a satisfactory solution for a new way of calculating rankings,’ Blatter said in a statement. Campaign spokesman Dave Smith told Reuters: “We surveyed 10,000 supporters in 80 countries. They really liked the power of the Shankly quote. Shankly’s passionate commitment to the game gave him the top spot above Cantona, who once bewildered fans by saying: “When the seagulls follow the trawler, it’s because they think sardines will be thrown into the sea”. The third place went to former England midfielder Paul Gascoigne for saying: “I never predict anything and I never will”. BBC commentator John Motson took two of the top-10 spots. “I think this could be our best victory over Germany since the War”, said Motson, who also once declared “the World Cup is a truly international event”. Former Manchester United great George Best, famous for his passion for the good life, was at number eight in the poll for saying: “I spent most of my money on birds, booze and fast cars. The rest I just squandered”. The Plain English Campaign is an independent group which urges clearer information in public documents. Argentina’s Horacio Elizondo was selected to referee Sunday’s World Cup final between three-time champion Italy and 1998 winner France. Elizondo, a 42-year-old physical education teacher, officiated Portugal’s quarterfinal victory over England, when he sent off England striker Wayne Rooney for stepping on Portugal defender Ricardo Carvalho. The Argentine official also was the referee at the opening match on June 9, when host Germany beat Costa Rica 4-2 in Munich. Dario Garcia and Rodolfo Otero, also of Argentina, will work the sidelines for the match at the Olympic Stadium in Berlin, FIFA general secretary Urs Linsi said yesterday. The triple defending champion destroyed his 34-year-old unseeded opponent in a display of brutal brilliance before a beguiled Centre Court crowd. It was the heaviest Wimbledon men’s semifinal defeat in terms of games since the abolition of the challenge round in 1922 and, at 77 minutes, was the briefest semifinal on record since 1972. An inspired Rafael Nadal beat Marcos Baghdatis 6-1, 7-5, 6-3 in the other semifinal. The Spanish second seed, who beat Federer in the French Open final last month, battered his Cypriot opponent to a standstill in front of an enthralled Centre Court crowd. Twenty-year-old Nadal became the first Spanish man to reach the final here since Manuel Santana in 1966. Leander Paes’s Wimbledon sojourn came to an end as he lost both in men’s doubles and mixed doubles. In men’s doubles semifinals today, Paes and his Czech partner Martin Damm lost 2-6, 1-6, 5-7 to Fabrice Santoro and Nenad Zimonjic. Fourth seeds Leander Paes and his Australian team-mate Samantha Stosur crashed out of the mixed doubles event after suffering a straight set defeat against the formidable but unseeded American pair of Bob Bryan and Venus Williams in the quarterfinals here. The Indo-Australian player tried every trick in the book but found the going tough against their American opponents who took just over an hour to carve out a 7-6(7/3), 6-3 victory. The 49-year-old Czech-born American, unbeatable in her heyday, vowed to come back as a spectator, but called it a day as a player having lost 5-7, 1-6 alongside Mark Knowles yesterday in the third round of the mixed doubles to Vera Zvonareva and Andy Ram. She also competed in the women’s doubles yesterday, losing in the quarterfinals. Her final Wimbledon titles tally thus remains 20, including 11 in the singles, keeping her level with Billie-Jean King, who also won 20, six in the singles. The 56-year-old South African today became the sixth ICC chief, following in the footsteps of Lord (Colin) Cowdrey (1989-93), Sir Clyde Walcott (1993-97), Jagmohan Dalmiya (1997-2000), Malcolm Gray (2000-03) and Ehsan Mani (2003-06). Addressing the ICC Business Forum at it’s spiritual home Lord’s, Mr Sonn also revealed that he was planning an early Zimbabwe visit to assess the situation there.